Photo courtesy of Bernadette Hoyle. “Tar Heel Writers I Know.” John F. Blair, Publisher. 1956. Winston-Salem, NC. (1891-1973) was the third of seven children born to an eastern Wake County farm family. Her early life was centered in the Mt. Moriah Baptist Church, her large extended family, and the social and practical concerns of turn-of-the-century rural life. She graduated from Meredith College in 1913, and worked as a high-school English teacher until shortly after her 1926 marriage to Seaboard farmer Herbert Kavanaugh Harris. Following her marriage, she took part in community dramatics activities and taught playwriting classes in her living room to local women, sharing knowledge she had gained as a summer school student under Frederick H. Koch at the University of North Carolina. 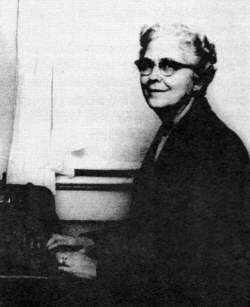 In the 1930s she began sending character sketches and human interest stories to the Norfolk and Raleigh newspapers. Her work caught the attention of editor Jonathan Daniels, who suggested she write a novel. Her first attempt, Purslane, won the 1939 Mayflower Society Cup as best North Carolina book of the year. The episodic novel is based on Harris’ childhood memories of her home, family, and community. She wrote six more novels over the next decade, each of them loving, occasionally satiric, evocations of human behavior with all its strengths and weaknesses. Her 1946 novel, Janey Jeems, followed the fortunes of a hard-working, religious country family that the author only inferentially indicated was black. The novel was noted by its publishers as the first by a white author about African-Americans to have the humanity not to mention race. After her husband’s death in 1950, Mrs. Harris once again grew active in community dramatics, holding writing classes and staging productions in local towns and at the state festival. A dramatization of one of her novels was nationally televised. In 1963, she began teaching non-credit creative writing classes at Chowan College, as much for the pleasure of meeting imaginative people as for anything else. She once said, “People, not books, have always been my first interest in life.” One of those teacher/writers whose minds are stimulated by contact with students, her teaching resulted in two of her favorite books, Southern Home Remedies and Strange Things Happen. She received, posthumously, a Brown-Hudson Folklore Award for these two collections from the North Carolina Folklore Society. Her other honors and awards included honorary degrees from Wake Forest University and the University of North Carolina at Greensboro, and the North Carolina Award for Literature in 1966. She served as President of the North Carolina Literary and Historical Association, and on the board of trustees of the State Library Commission and the North Carolina Arts Council. She was also active in the North Carolina Writers Conference and the Roanoke-Chowan Group. View the Bernice Kelly Harris collection at the University of North Carolina University library.